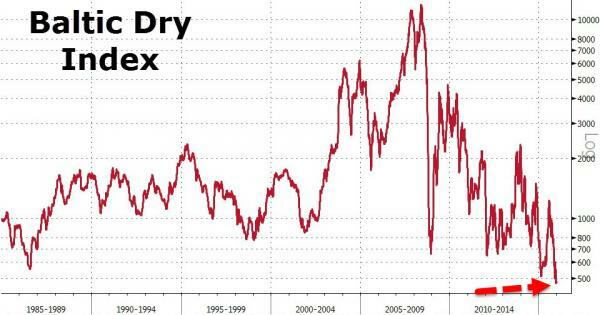 Following disappointing China PMI data and a collapse in US ISM Manufacturing imports data, the fact that The Baltic Dry Index has collapsed to fresh record lows will hardly be a surprise to many. 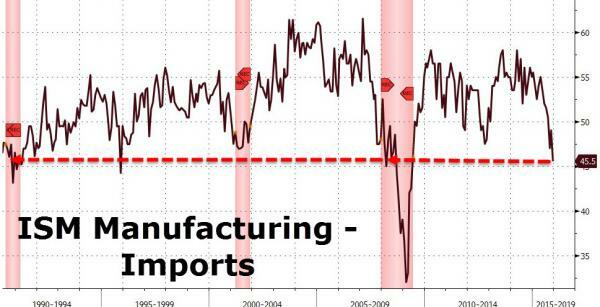 However,as Deutsche Bank warns, a "perfect storm" is brewing in the dry bulk industry, as year-end improvements in rates failed to materialize, which indicates a looming surge in bankruptcies. The improvement in dry bulk rates we expected into year-end has not materialized. And based on conversations we've had with several industry contacts, we believe a number of dry bulk companies are contemplating asset sales to raise liquidity, lower daily cash burn, and reduce capital commitments. The glut of "for sale" tonnage has negative implications for asset and equity values. More critically, it can easily lead to breaches in loan-to-value covenants at many dry bulk companies, shortening the cash runway and likely necessitating additional dilutive actions. The majority of publically listed dry bulk companies have already taken painful measures to adapt to the market- some have filed Chapter 11, others have issued equity at deep discounts, and most have tried to delay/defer/cancel newbuilding deliveries. The additional cushion, however, is likely not enough if asset values take another leg down; especially given the majority of publically listed dry bulk companies are already near max allowable LTV levels. The move to sell assets in unison can lead to a downward spiral, where the decline in values leads to an immediate need for additional equity to cure LTV breaches.